Grenada walking trails have become more of a feature on the itineraries of visitors to the island in recent years. The Grenadian government put in preservation and protection measures for the ecology of the island in the form of national parks and reserves. Bring an umbrella. You never know when there’s going to be a shower and some of them can be heavy. An umbrella makes more sense than a waterproof. Wear lightweight walking shoes. There’s no need for the heavy boots. You’ll get too hot. Even strong waterproof sandals could be the right choice. Keen has some great designs. Wear sun protection. A good hat and slosh over the sunblock. You may want to bring some insect repellant if you’re heading away from our hotel. (We don’t get a lot of mosquitoes due to the onshore wind we have). An extinct volcano at the centre of the rainforest is home to the Grand Etang Lake. Vegetation is lush and rich in it’s diversity with rare orchids and hibiscus. Keep an eye out for lizards, frogs, hummingbirds, the broad-winged hawk and mona monkeys. In addition, you may witness an opposum or even a mongoose. 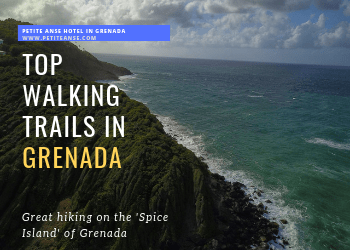 This is the most popular walking trail area in Grenada and with the amount of wildlife it’s possible to see, it’s not surprising. Leading around the perimeter of the Grand Etang Lake, this walk will take just 30 minutes or so. You’ll earn yourself great views of the lake and the trail will take you down through trees that are host to orchids and hibiscus. A rather challenging hike that can take even the most experienced of walkers 3 hours. The effort is definitely worth it though. You’ll pass seven beautiful waterfalls and will wander through virgin forest. Take a guide and a camera with you. Mt Qua Qua is one of the highest mountains in Grenada at over 2000ft up. This walking trail will take you past the lake and up to the elfin mountain forests and the upper slopes. You’ll experience cooler temperatures and it can be slippery and steep at points. This 90-minute walk will take you through several ecosystems and will reward you with a few fantastic panoramic views. The Concord Falls walking trail can be taken from the Mt Qua Qua trail. After 60 minutes, you will pass under the lush canopy of the rainforest, walk past babbling brooks and over hills to the magnificent falls. The lowest falls has a swimming area, but with another 20 minutes walk you will reach the serenity of the middle level falls with another swimming area. To reach the third cascade, you’ll have another 2-hour hike. Levera National Park has 450 acres of land. It contains some of the top coastal scenery that Grenada has. The lagoon is the most important preserved habitat to a variety of birds and a mangrove swamp. A trail encircles the lagoon and it’s really quite a nice walk. If you like birdwatching, you will love the La Sagesse Nature Centre. A salt pond attracts birds such as the Caribbean coot, the green-backed heron and the brown-crested flycatcher. The marine area provides 3 gorgeous beaches and good snorkelling. 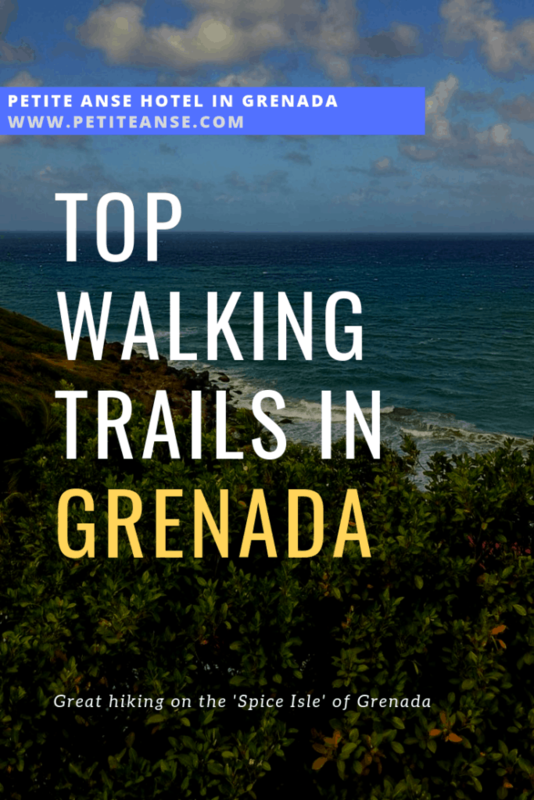 If you have a favourite Grenada walking trail, let us know so that we can add it to our list.